Keep the iPhone display in check by adjusting its automatic brightness and other display settings. Mobile phones fit so well into our lives partly because they're able to adapt their behaviors to suit our needs. More than the likes of scheduled notifications or calender updates, smartphones can also automatically adjust their own displays to increase visibility in bright- or low-light environments. For some, these features help them get the most out of the mobile experience by ensuring that colors and brightness are always specially tailored by the system. It's an issue for others, however, as watching the iPhone display brightness changing on its own can be very distracting. Fortunately, iOS users can find a few options within the settings menu that will help them adjust the iPhone's automatic display to best suit their lifestyle. Mobile operating system developers know that just one display setting will never be enough, and the team at Apple have made sure getting into the iPhone display options is a quick and painless process. 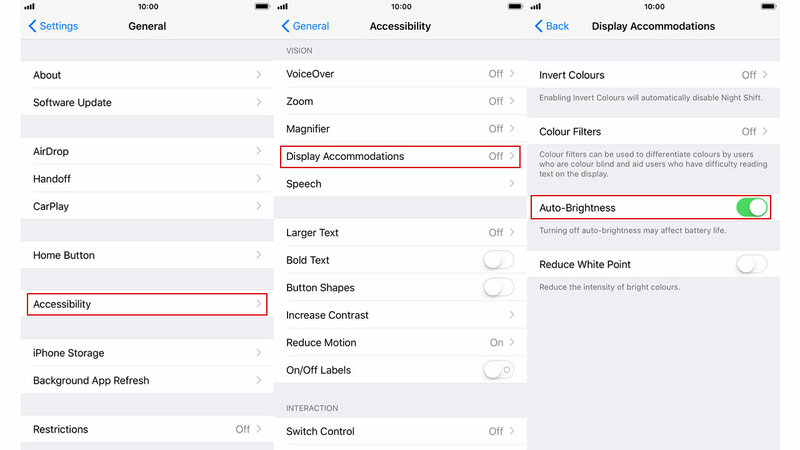 However, for some users the option to disable automatic brightness isn't found among the rest of the usual display settings; instead, it's found a few layers into the iPhone accessibility settings. If the automatic brightness toggle isn't in the Display & Brightness menu, here's where to find it. • First, navigate to Settings. • Once there, tap on General. • Locate and tap on Accessibility. • Tap on Display Accommodations. • Find the Auto-Brightness toggle and switch it to off. Changing brightness is such a common procedure that it can usually be accomplished in a few swipes, and the iPhone is no exception. To change the iPhone brightness, tap on Settings and navigate to the second option labeled Display & Brightness. From there, users will be able to use a slider to manually adjust their screen's brightness level. iPhone X users will also be able to find display settings in the Control Center. Users will also notice a control beneath the slider labeled True Tone. True Tone is a function that automatically adjusts the iPhone's color settings to adapt for the user's surroundings. In theory it should help the display look its best at all times, but if users don't their phone making any sort of automatic adjustments to the display, True Tone should be turned off.